Michael Ertel dressed in blackface at a private Halloween party 14 years ago, according to the Tallahassee Democrat. Editor's Note: The photos of Michael Ertel were provided courtesy of the Tallahassee Democrat, which first broke the story. 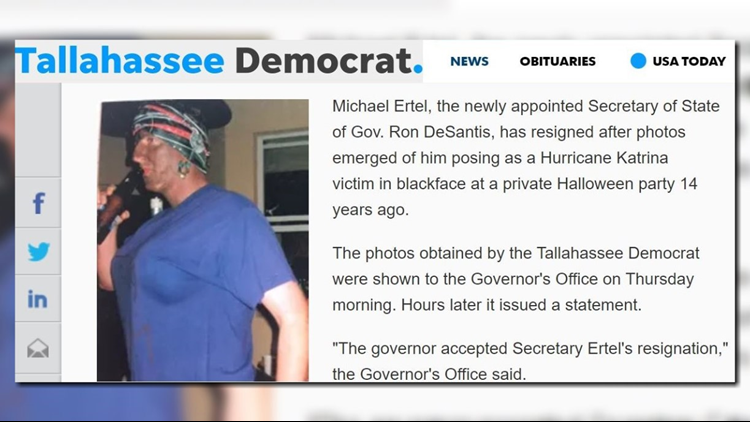 TALLAHASSEE, Fla. (AP) - Florida's top elections official has abruptly resigned after a newspaper obtained pictures of him in blackface posing as a Hurricane Katrina victim. Secretary of State Michael Ertel resigned Thursday afternoon just hours after he testified about election lawsuits before a state legislative committee. 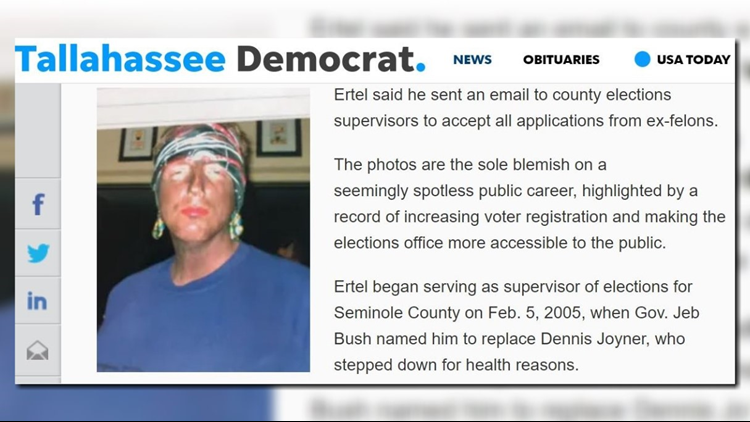 The Tallahassee Democrat obtained pictures taken at a Halloween party 14 years ago that show Ertel dressed in blackface. The photos were taken two months after the deadly storm ravaged the Gulf Coast region. More than 1,800 people died during Hurricane Katrina, according to a PBS News estimate. Ertel had been the Seminole County supervisor of elections and was picked by new Gov. Ron DeSantis to take over the department that oversees elections. Gov. DeSantis, who accepted the resignation, addressed the situation during an unrelated news conference on Thursday. "It's unfortunate. He's done a lot of good work," DeSantis told the newspaper.